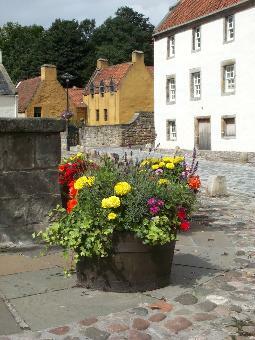 Culross village (National Trust for Scotland) is 12 miles west of the Forth Road Bridge. 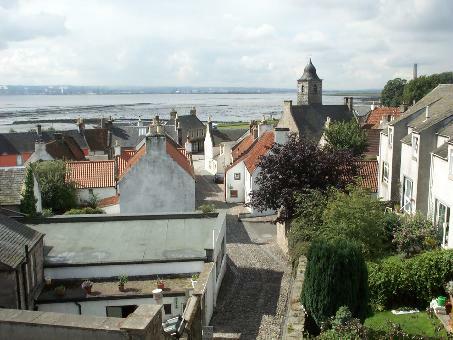 Culross is a Royal Burgh. Royal Burghs were generally sea ports, were represented in the Scottish Parliament and could appoint magistrates with wide powers in civil and criminal justice. 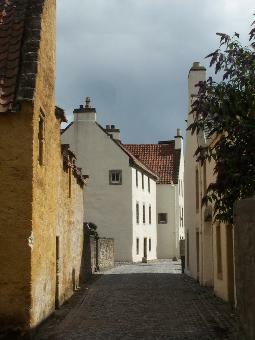 In the 16th and 17th centuries Culross was a thriving community, with a flourishing trade with the Low Countries, as evidenced by the architectural style of the village. There was once important coal mining and salt panning industries, but throughout the 19th century the village's fortunes declined. 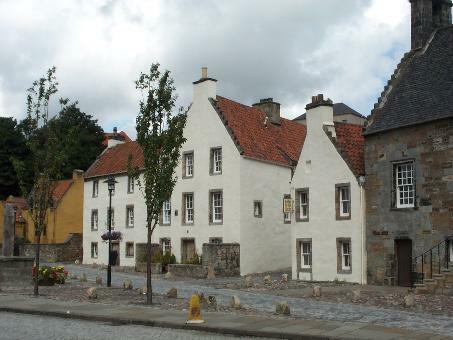 The National Trust for Scotland has been working in Culross since the 1930s to conserve its historical past. The Community Garden, featured on BBC TV. 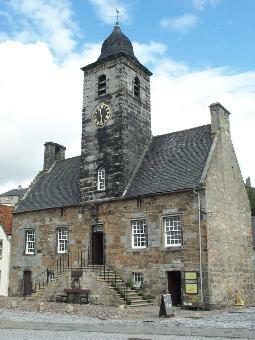 The Town House is now used as The National Trust for Scotland Visitor Centre. It was built in 1625 and the architecture has a strong Flemish influence. 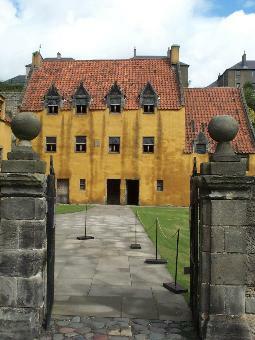 The Palace (or Great Lodging) is a late 16th / early 17th century house, the former home of merchant Sir George Bruce. The building has been restored to include its original mustard yellow decor. The gardens to the rear of the Palace contain a variety of unusual vegetables, herbs and perennials, all available in 1600. Charlie Dimmock with the help of Charlie's Garden Army, created a Community Garden for the village from reclaimed land that was formerly a school playground. 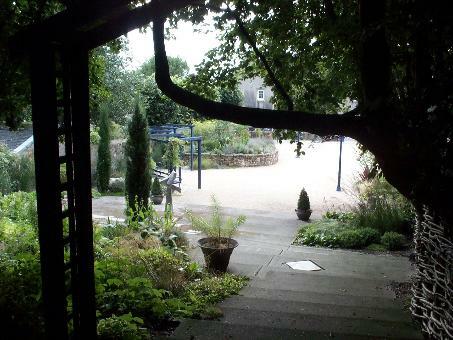 The garden was designed by Mrs. Dilys Livingston, a local landscape artist. The village looks across the River Forth to industrial oil refineries, a power station and a derelict colliery, a marked contrast to Culross's natural beauty. The Mercat (Market) Cross has a unicorn on top. The cross was the symbol of a burgh's right to trade and was located in a town's market place. Culross Abbey was founded in 1217. 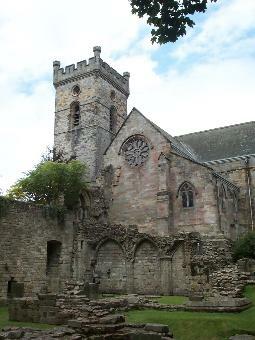 The Abbey ruins are currently cared for by Historic Scotland. Part of it still serves as the Abbey Church. 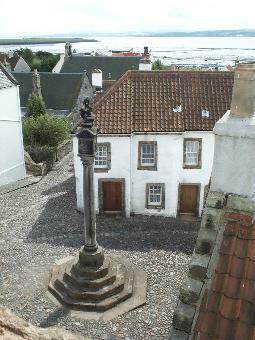 The church has a vault and monument to Sir George Bruce, Culross's entrepreneurial merchant.